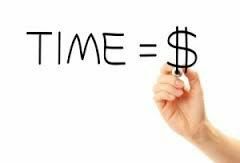 There is a very old adage that says time is equal to money. Many of us have heard of it . Usually those people who believe this to be true have achieved great success in their lives. They are the CEO’s and entrepreneurs who grace the covers of popular magazines and newspapers. For the rest of us this saying means punching in and out at a time clock. That is how we calculate our time being equal to money. If we take this equation and look at it in a whole new way, it will open doors once never considered. What if we all thought about how much money we would like to make? If you are laughing at an absurd number that just popped into your head, write that number down. Keep that piece of paper with you wherever you go. It will serve as a reminder of where you want to be. You need to be able to look at that piece of paper often. At first you will continue to chuckle to yourself at the absurdity of it. But as time moves on you need to change your thinking. Begin to consider doing things that would place you in a position to make that amount of money. The removal of all obstacles from your mind is essential. To attain the goal you must not think about anything that might or is standing in your way. Look for places that will get you an introduction to someone who may be able to point you in the direction you are seeking. Let go of all the places you have been in. It is time to start something entirely new. Engage with people who are also looking to change their lives for the better. Make a list of all the traits you have that are going to help you make a positive change. Maybe you are great with kids, numbers or other people’s money? Whatever it is there is a market for it out here in the world. Next you must let people know what you are good at and why they should hire you for your services.You can network in groups face to face, join an online network or use social media. I personally recommend doing all three of these things. Building an online presence is not any different from networking in person. People are looking for the same things from you as a professional. They want to see if you have any referrals and they also are looking for consistency. Being well respected for what you do and providing quality will bring to you what you really are worth!